Boeing’s Richard Aplin (Senior Manager Technology Transition Phantom Works International) briefing the companies. Aerospace and defence specialist Boeing Defence Australia is one of the primes collaborating with Techstars Adelaide’s global accelerator program to work on a wide range of defence and security related technologies with 10 start-ups. 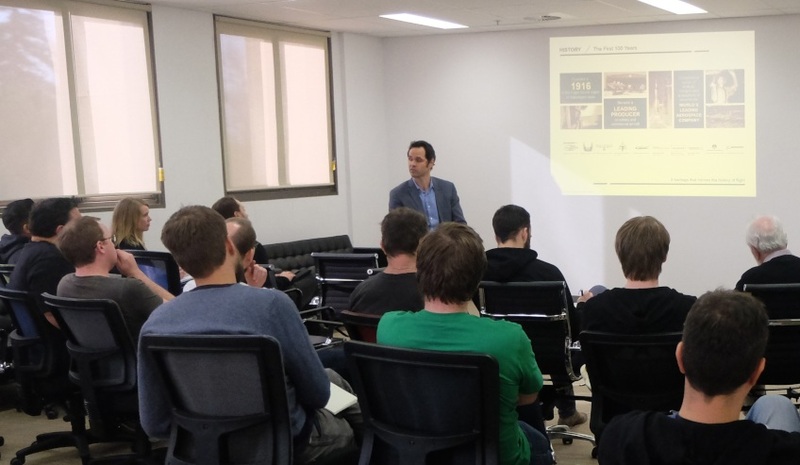 As reported on Defence Connect, Techstars Adelaide, which is part of the Techstars Worldwide Entrepreneur Network, has selected four Adelaide start-ups, one Melbourne, one Brisbane start-up and four overseas start-ups for its 13-week intensive program. The 10 selected start-ups, chosen from applications from 49 different countries, will gain access to high profile mentors, the Techstars global network, a newly renovated work space in the Adelaide CBD and a cash investment of up to US$120,000 in their companies. Earlier this year, Boeing announced a $500,000 investment over five years in the Adelaide-based Techstars global accelerator program as part of Boeing’s expanding presence in South Australia. Boeing will offer the 10 high-tech start-ups an international network of resources including teammates and expertise from Boeing HorizonX, an innovation cell focused on accelerating potentially transformative aerospace technologies, manufacturing innovations and emerging business models. Techstars mentor and director of Boeing’s Phantom Works International Dr Shane Arnott said the Techstars Adelaide partnership formed part of Boeing’s investment in Australia’s sovereign defence capability. "Techstars Adelaide is an exciting opportunity for Boeing to play a key role in developing scalable solutions with a global impact right here in Adelaide," said Arnott. "We will work closely with these companies, providing access to Boeing experts and advanced research and technologies to assist them to refine their product offering in readiness for commercial application." Techstars Adelaide manager director Terry Gold said he was looking forward to working with the top 10 to help them grow their companies while introducing the overseas founders to Adelaide. "From drones to data analytics, from virtual borders to rocket science – we’ve assembled a group of the most exciting technology start-ups working in and around defence today," Gold said. "By bringing these teams together and linking them with start-up experts and industry specialists we will help them rapidly scale up their businesses." All participants will benefit from lifetime access to Techstars resources, connections to investors and the Techstars global network of over 5,000 entrepreneurs, alumni and mentors.